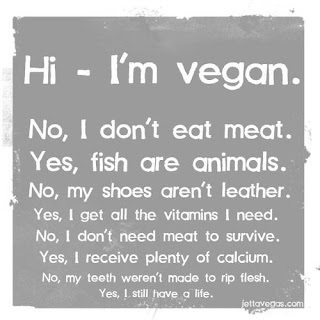 Disclaimer: I am not convincing or “preaching” to anyone to be a Vegetarian or Vegan. I don’t think I’m better than you if you’re not a Vegetarian, I promise. In fact, the only other person I regularly interact with that doesn’t regularly consume meat is my husband. 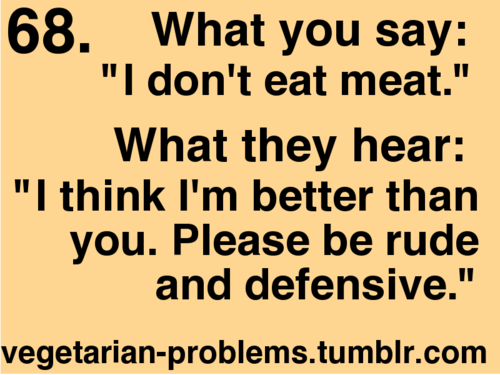 For some reason any talk of a meat free lifestyle tends to rub people the wrong way, however, I can’t even count the number of times non-Vegetarians feel the need to tell me about their eating habits once they find out mine. 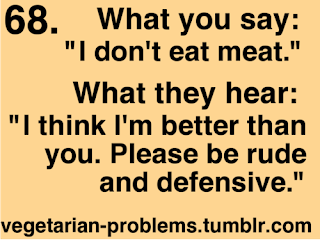 Especially how much they love meat nomnomnom, while shoving it in my face. It’s sad I need this disclaimer, right? 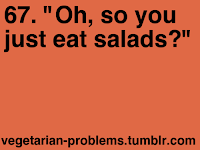 I’ve been a Vegetarian since 2008. The weird thing that triggered it? The floods in Iowa. 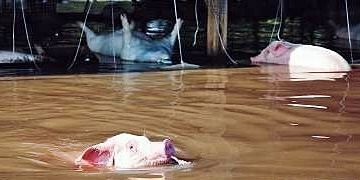 I saw footage of pigs, some floating dead and the few survivors struggling to keep their little snouts above water. Trying to survive. For some reason that very second I decided to not eat meat and it’s been almost 4 years now. I always had thoughts of it in the past, being a huge animal lover, but it was that footage that was my wake up call. For my health. 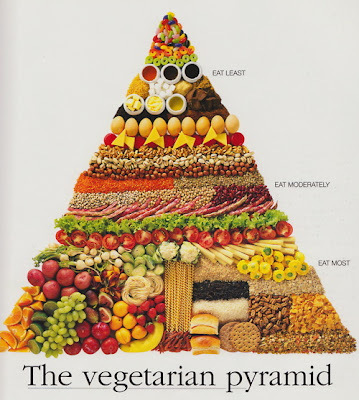 “Vegetarians have lower rates of heart disease and some forms of cancer than non-vegetarians.” (Brown University) On top of that? Lower rates of diabetes and obesity. 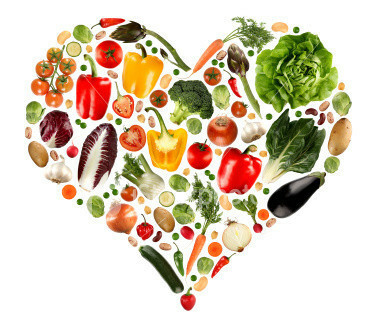 There are tons and tons of health reasons that are huge perks to being meat free. I also just FEEL healthier and my food feels clean, which is hard to explain. Kind of how I wipe excess grease off pizza, it makes me feel gross. Most meat that is raised for human consumption isn’t raised naturally, like in “the good ol’ days” when Old McDonald’s cute farm animals grazed in fields. I won’t go into too much detail, there are many documentaries and books available if you’re interested in that topic. For the animals. Some animals are carnivores and have to eat other animals to survive, humans are not one of them. I am not 100% against animals eating animals, human or not. 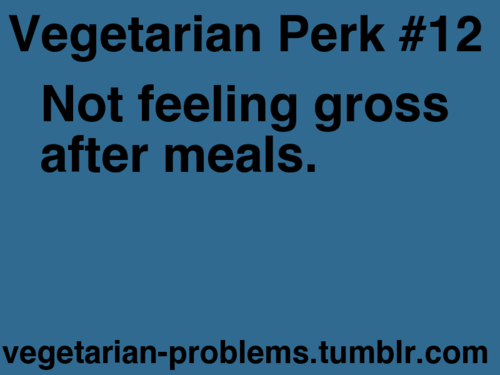 Most Vegetarians won’t see my view on this. Animals eat animals, right? It’s the circle of life, some would say. What I am against is the terrible conditions in which the animals we raise to eat live with only to be put through long and painful deaths. I just hate to think about it and if I can avoid supporting that industry and eating the products of that torture, I will. For the environment. Factory farming is one of the biggest polluters. Air and water pollution among other things. Think about thousands of farm animals and the waste they produce. Gross and unhealthy for anyone in the area. 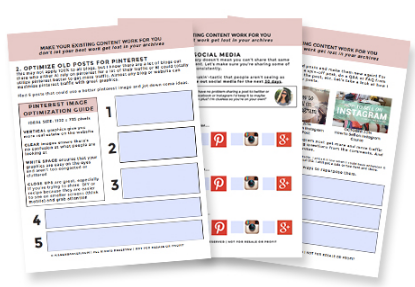 If you have pets, imaging having hundreds or thousands and much, much bigger. When I first decided to stop eating meat I got a lot of crap from everyone I knew. The only supportive people were my sister and my boyfriend (now husband). It started out with my sister being Vegetarian with me, now she’s not. But now my husband who wasn’t into it when I first started isn’t fully Vegetarian, but eats Vegetarian probably 95% of the time. His exception is if there are leftovers that someone is going to throw away, he refuses to let it go to waste. There were the people who said it would last a couple of weeks. There were the people who didn’t understand my choices and chose to criticize me and be just plain rude. There were the people who said that I care about animals too much and who cares if they live terrible lives that end in agonizing deaths, they’re just animals. I still get it, but most of the people I know have given up on trying to get me to eat meat since it’s been years and it hasn’t worked yet. Eating before you go to a party or get together at someones house to avoid starving all night. 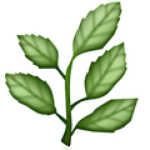 People trying to convince you that plants have feelings too and it’s wrong to kill them, so obviously you’re being a hypocrite. Being polite when something on the list above happens to you more often than not. I could go on and on. Come on, are you laughing with me yet? I’m not saying EVERYONE is like this, but a lot of people are. Here’s something that people call me a hypocrite for: My dogs and cats have been on a raw diet for the past couple of years. I won’t go into too much detail, but I did a lot of research after those pet food recalls. Yes, raw meat. Why? 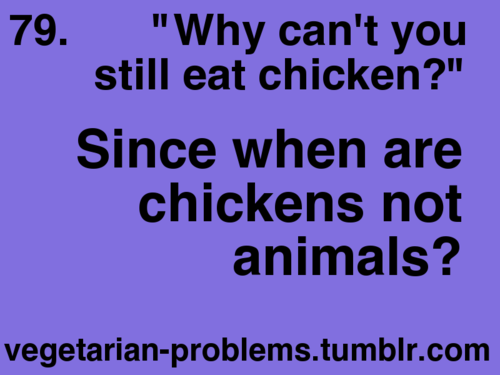 Because they DO need meat to thrive, unlike humans. No they aren’t dead from salmonella. No it’s not going to make them sick. There are no kibble trees in nature, this is what they were made to eat. Their teeth were made to tear flesh, their bodies were made to digest it. Their teeth and coats are amazing, without ever having gone for a teeth cleaning. I’m switching to a partial raw, partial kibble just for my own convenience because I have 4 dogs and 3 cats. Keeping that much meat on hand, in a town where meat is about 25% more expensive than where we used to live, was getting difficult. There, I said it. And yes, it’s hard to handle meat when I am so used to not eating it. I’ll be honest, I’m not always the healthiest person out there. I love bagels and spaghetti and I almost never eat salad at home. But I will say that ever since changing over to this meatless diet, I eat probably 3x as many fruits and veggies and I used to. 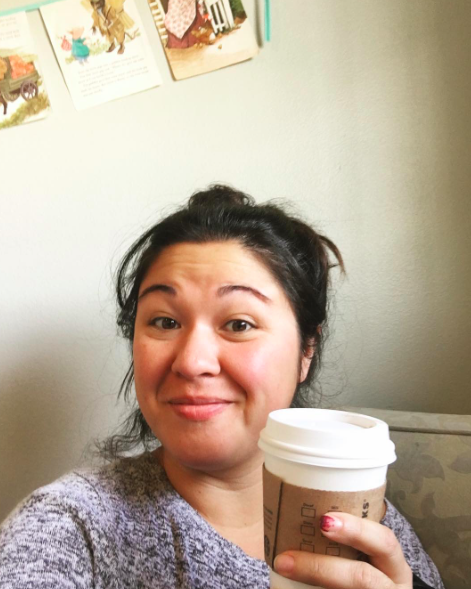 I feel so much healthier and better about myself and my conscience is clear. The food can be delicious. I don’t eat tofu or even fake meat everyday. Most things I miss can be made meatless. 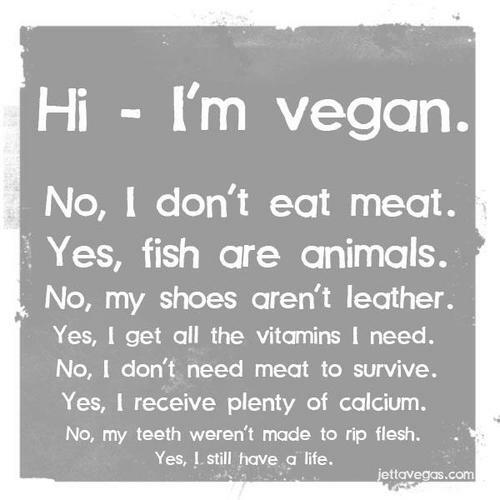 And even if I do miss certain meals that I used to eat, the thought of chewing on the flesh of another animal just freaks me out at this point. In the last few years I’ve had small accidental bites of meat that I didn’t know was there and I tried sushi that contained fish, but the thought just freaked me out. 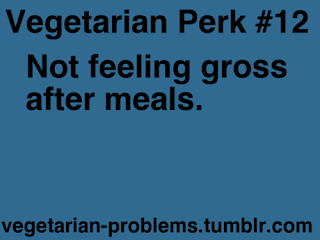 I’m not the strictest Vegetarian. I used to know a guy who wouldn’t even allow meat to enter his apartment. I’m not that strict, in the last year I have had exactly two pieces of sushi with tiny amounts of fish in it and an bite of a turkey burger that they accidentally gave me instead of my veggie burger. 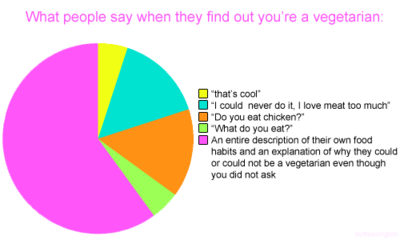 People have different views on Vegetarianism. I do my best to check labels, but I’m not perfect or obsessive about it. I’m not saying I’ll be a Vegetarian forever. Who knows what will happen in life? I don’t plan on stopping and now that Blaine and I are the only ones in our house it’s so much easier to live our lifestyle. 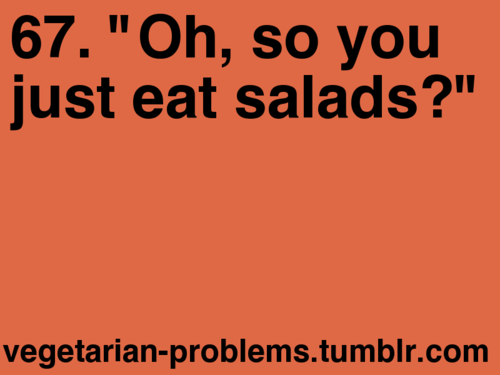 I do know that I’m going to try and be a better Vegetarian. This means more veggies, less easy carb meals like spaghetti and bagels. No carbitarian eating. That’s no good. When we decide to have children, we plan on raising them on whatever diet we are on. I’m assuming we will still be Vegetarians at that point in which case, so will our children. I can’t wait for the commentary from other people when I “force” my decisions on my children. Last time I checked, a three year old can’t cook for himself so… he gets what I make. We’ll cross that bridge when we get there. 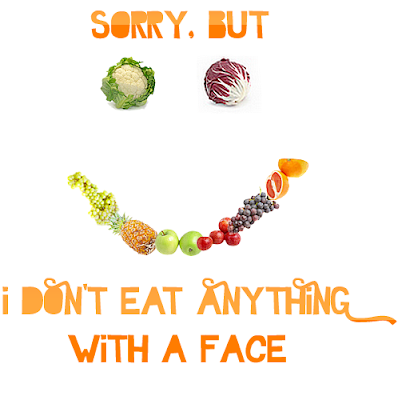 I met a girl in my Philosophy class who was raised Vegetarian and has never had a bite of meat. I don’t know if that was an exaggeration, but I do remember that she explained her views so well. I asked her if she had ever been tempted to try meat. She told me that she wasn’t raised to think of animals as food. “Would you be tempted to eat this desk?” Good answer. There it is. 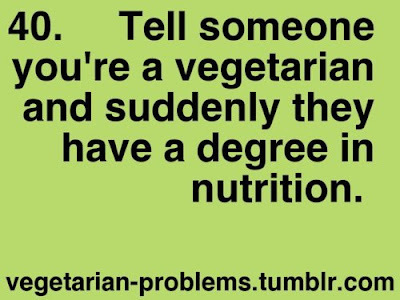 I’m a Vegetarian and I love it. preach it sista!!! we are vegetarians too… and we’ve never been healthier! I was watching ellen a couple years ago and this guy was on the show and he was telling the audience that if every meat eater in the US skipped meat one time in a week (ie eating 4meat meals instead of 5 a week) it would be the equivalent to taking 2 million cars off the road! It’s not asking too much I think. That’s why I don’t eat meat at breakfast. 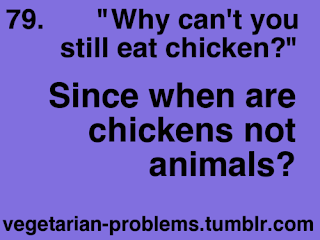 Lol it’s not like meat eaters have to give up meat. I have two Golden Retrievers and a Shih Tzu who have been eating Natural Balance Vegetarian dry dog food (plus raw veggies when I’m prepping meals). They are all three really healthy. The Goldens are 8 and 9 years old now and bouncy like pups, gorgeous hair, never needed teeth cleaning and no illnesses. I rescued one at about age 2, the other was 6 months old. The Shih Tzu was a rescue 2 years ago and has been on this same diet since he arrived at my house 2 years ago and he is doing really great also. I researched a lot before I went this route but I am so, so glad that I did.